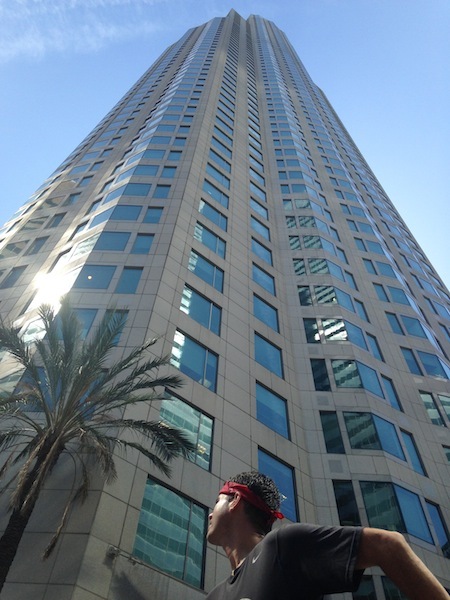 I Raced Up a 75-Story Building. What Did YOU Do Over the Weekend? 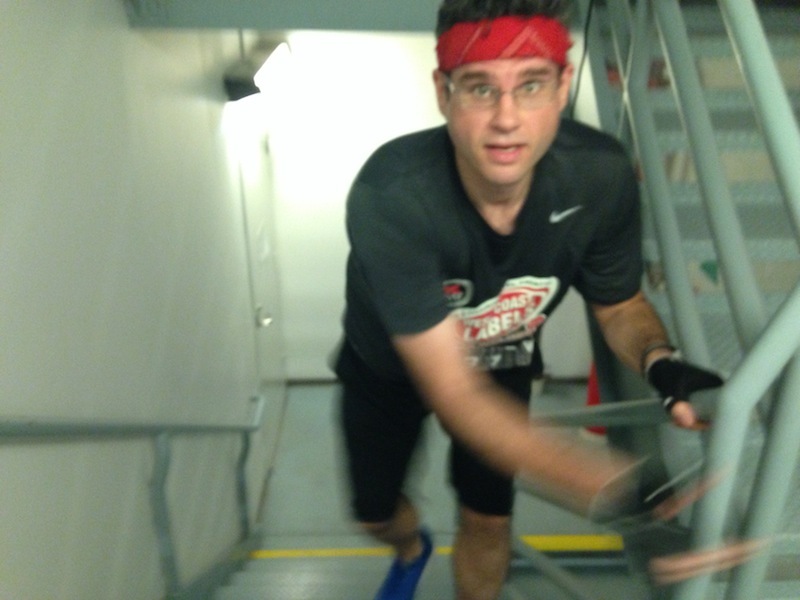 (2015 Stair Climb for Los Angeles Race Recap) | Keep It Up, David! First off: this headline is not an arrogant, holier-than-thou brag. Yes, I raced. Yes, I’m proud. But not for the reasons you think, because it was actually a really crummy day. This headline is meant to inspire reflection on your own accomplishments, big and small, because they all matter. More on all this to come… Let’s just get right into my own crummy day, shall we? 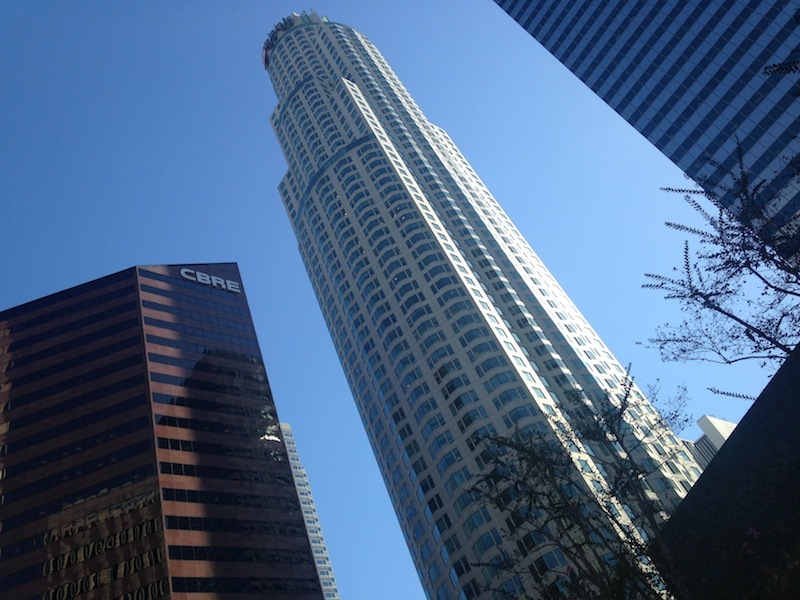 Meet the 75-story US Bank Tower, which is the tallest building west of the Mississippi and the host for the Downtown-Ketchum YMCA’s annual Stair Climb for Los Angeles. More than 3,000 people race up the stairs to the roof every year (all 1,664 of them!) to raise money for the Y’s community and after-school programs. This was my third year racing, and I worked hard training for the big day. My goal was to set a personal best. My time was 20:29 the first year, and last year, I knocked nearly two minutes off, finishing in 18:30. For the first time at this race, I was accepted into the Elite wave of racers – the fastest of the fast – and we got to enter the building first. 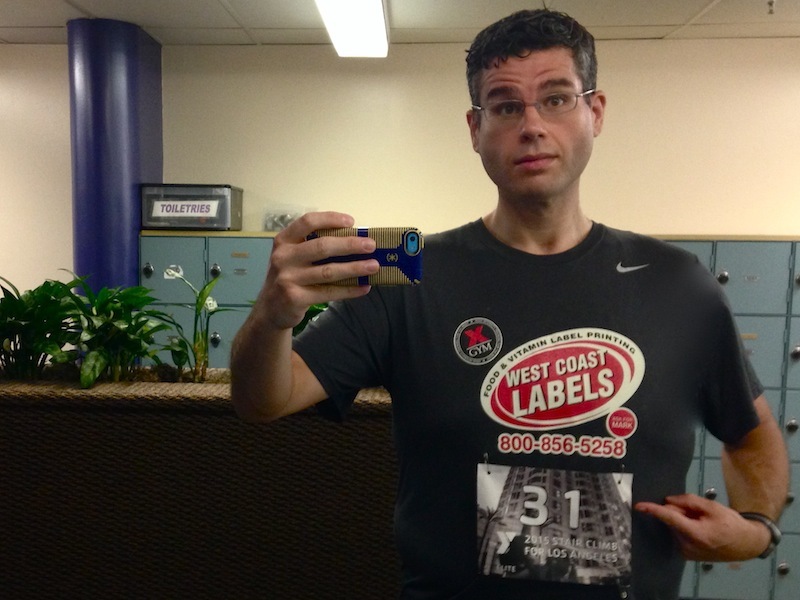 I also got an awesomely low bib number: 31! It was a hot day, but I was excited to go, get this over with, and celebrate my new PR. We waited in the adjacent building’s lobby for our chance to enter the stairwell – one person every 15 seconds. I entered the stairwell at 11:37am and started an impossibly long trek up a seemingly endless stairwell. IT WAS ON! 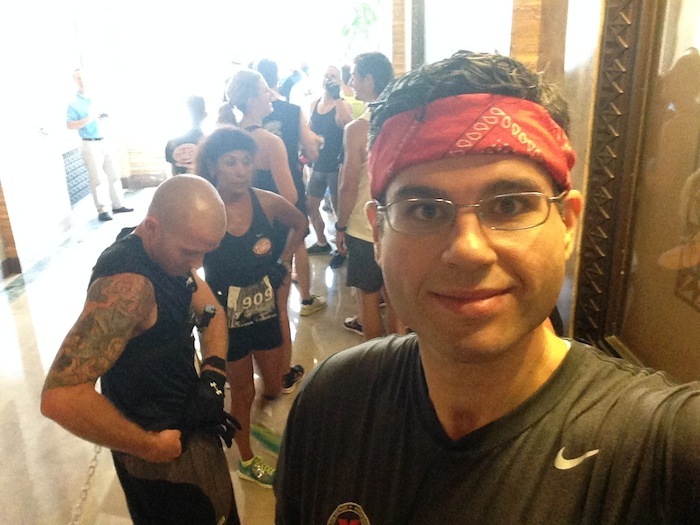 The race was grueling, but I pushed myself, stayed positive, and climbed aggressively. The nice thing about the Elite wave is that stairwell is nearly empty – so there wasn’t much passing going on, and I could focus solely on what I was doing. RELATED CONTENT: For more on stair racing, and my history with the sport, check out my 5-minute video here! Like at most races, I got to a point where my legs were screaming, my lungs were aching, and my heart was pounding… only to look up and see I was still dozens of floors from the finish line on the roof. All I could do was keep going. And I did. One of the most exciting moments in this race is when you see natural sunlight streaming into the stairwell from above. It means you’re almost done, and it’s time for the final push. So I pushed. I flung myself across the finish line and collapsed on the roof. I felt good (especially after my heart rate cooled down a little bit) until I checked my watch. Could that time be accurate? It seemed unreasonably high. I decided to wait for the official results from the timing company, and headed to the recovery room on the 67th floor for fruit and water. I didn’t fully enjoy any of it – not the views, nor the sense of accomplishment – with this lingering question of my time looming, so I checked the results as soon as I got on the ground. My time was 20:35. It was my slowest time yet. Over two minutes from my goal. My heart sank. This isn’t how it’s supposed to go. I worked hard for this race. I didn’t slack in the stairwell. What happened? I’m heavier than last year. Not by a lot, but every pound counts, especially when you have to carry them up 75 stories. I used a metronome during the race, despite having not trained with it very much. I thought the metronome would help me from going out too hard too fast (a common problem I have), but introducing a major element during a race probably wasn’t the best idea. As I mentioned, it was a hot day. The stairwell seemed even hotter. Heat can be a killer! It just wasn’t my day. It happens to everyone, including the Michael Phelps and the Usain Bolts out there. They didn’t seem like reasonable theories at the time, though. I felt crushed. I felt like a failure. All I wanted to do was run to my car, go home, and head to bed – and maybe hit a drive-thru or six on the way. I stewed like that for 20 or 30 minutes, and after lots of introspection and a pep talk or two from friends, I realized I had an opportunity to salvage the day. I could turn this all around. I could make this day really special. And to do that, all I needed was… A STAIRWELL. 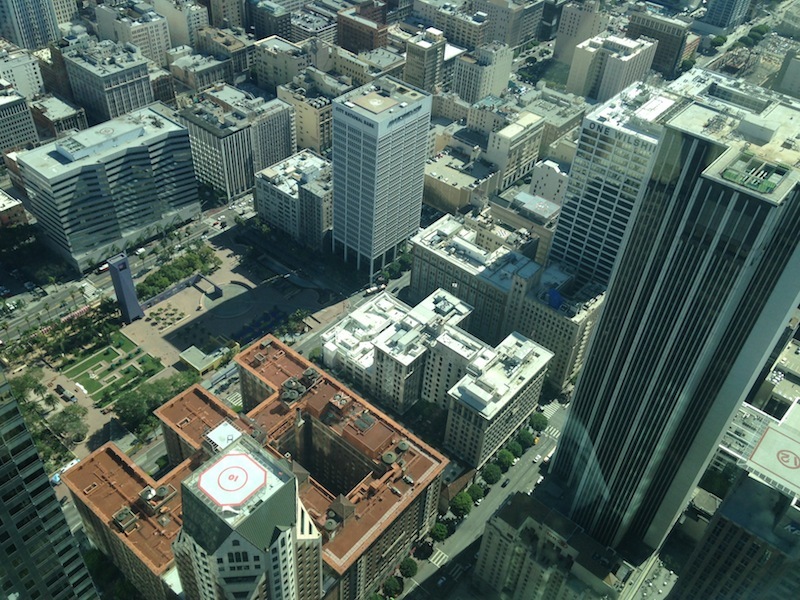 I returned to the US Bank Tower stairwell, and climbed it again. There was no pressure, no bib, no time. (Race organizers allowed as many repeat climbs as desired.) I turned a timed race into an endurance workout, and by the time I got to the roof, I felt so much better. My second time passing the roof access sign, after crossing the finish line. So I climbed it a third time. My legs groaned as soon as I entered the stairwell on that third ascent, but they hung in there, and I pushed myself up, up, up… and eventually there was nothing but blue sky above me. My third visit to the 67th floor recovery room felt especially sweet. I love the views after the race – and there was no doubt in my mind that I had earned these views. These views came after 225 floors of stair climbing – 4,992 steps! 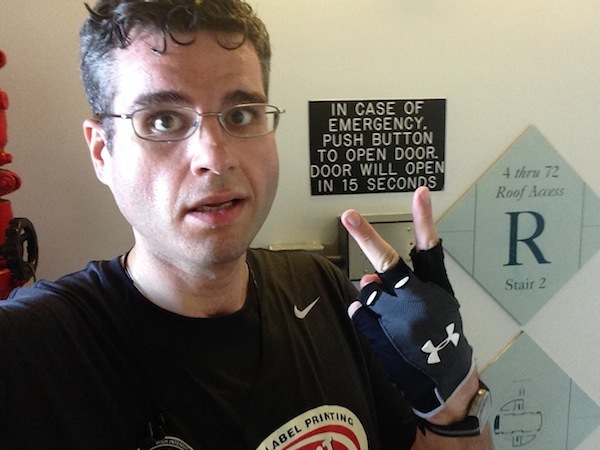 What I reminded myself, in the elevator, as I came down after that third climb, is that I showed up. I showed up at the race, certainly, but what I really did was take a negative situation and wrestle it into a positive one, and, by doing so, I showed up for myself. I showed up because I’m not a quitter. I showed up to silence that voice in my head – the one that tells me I’m not capable, good enough, able, or strong enough. I AM STRONG. I AM ABLE. AND I CAN. I showed up because I have so much invested. I trained for the race, yes, but I’ve been working towards this day – and every day – for 5 1/2 years – ever since I woke up, at 402 pounds, and decided it was time to take a step in a different direction. I showed up because these races are an integral part of my weight loss success – 160 pounds lost and kept off – and I don’t want to imagine a life where I’m not competing in the first sport I’ve ever found that I honestly love. Which brings me back to the headline of this post. I managed to turn a crappy day into a successful one, and that’s an accomplishment worth celebrating. EVERY accomplishment is worth celebrating, and sharing those accomplishments is a good way to celebrate. What did YOU do over the weekend? No matter how big or small, every step in the right direction is an achievement, and who knows? Your steps may inspire someone else to keep plugging away at their own goals. I’m going to channel this energy into my next stair race – this weekend, at the Space Needle in Seattle. If I can climb 225 stories within a span of a couple hours, I sure as hell can race up 52! PS: For more stair race recaps from all across the country, click here. 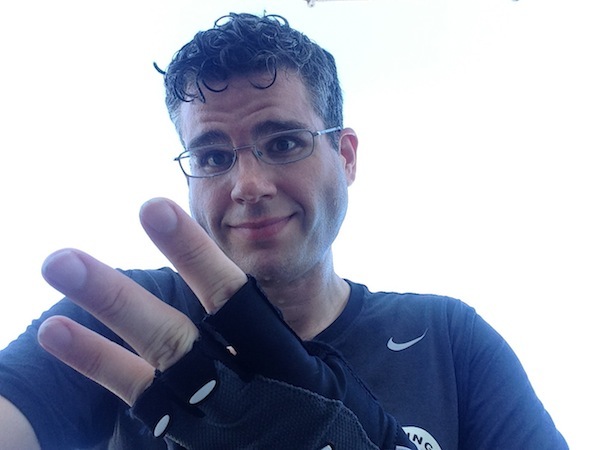 PPS: Huge thanks to the generous donors that got me to my fundraising goals. Laura, Dana and Stu’s contributions to the YMCA will do a lot of good in Los Angeles, and I’m so thankful! This entry was posted on Tuesday, September 29th, 2015 at 4:02 pm and is filed under Uncategorized. You can follow any responses to this entry through the RSS 2.0 feed. You can leave a response, or trackback from your own site. Excellent write up. I’m glad you tackled the climb a 2nd and 3rd time and turned the day around. Great work keeping it a positive experience and making it a fun day. While we all like to “set PR’s” – the time isn’t everything. As you said, we all have “bad days” but you showed up! Besides, you still climbed faster than over 2,000 of the roughly 3,000 other participants! Keep on showing up, David! What did I do Friday? … I sucked & blew, sucked & blew, sucked & blew … Ha! … I had a crummy day too, but spent the weekend researching ways I might be able to improve what I believe the weakest link in my chain is: my lungs/breathing. So I’m chalking Friday up to an educational experience, & focusing on the CF Climb in November. On the bright side, it was great seeing you & the rest of the step-family there. Most of ’em had a great day, so that makes me happy. I think it’s great you’re going to do the Needle, & I’m looking forward to your re-cap of that one too! Thanks, George! Your dedication to the sport is inspiring and it was great to see you there, too. See you in November – and probably at training sessions before then! Thank you! I hope you give the stair race a try, too. They’re fun, and you totally don’t have to race it. There are plenty of people of all fitness levels who do it at all speeds – you can definitely go at the pace that’s best for you. Nice write-up. I also trained for this climb and also found that my time was unexpectedly and disappointingly slower and not quicker than last year. My climbing buddies, Lois/Dan, said temp/humidity was a big factor that day. Ah well, the CF Nov climb is next for us, and we’ll see how that goes. Lois, Dan and I have signed up for the Scale the Strat, Feb 2016. It’s our first time for that one. And once again, your blog of a climb (2014 Strat) provides more information about a climb from a climber’s perspective than the sponsoring charity provides or that I can find elsewhere. So thanks! My sister-in-law, who’s not athletic, says she might climb. Do you have an opinion about the difficulty of this climb for a first-time climber? Based on your report, I’ve told her once in the tower she’s committed and could be difficult if she’s afraid of falling or heights. Do you recall if people could rest on the landings? Your blog a great read and very helpful. Keep it up, David! Bummer I didn’t see you at US Bank, but hopefully our paths will cross in November. Glad my recaps were helpful! I would guess that since a vast majority of people who participate in climbs aren’t racers, and do it more casually, most races allow for rest on landings. I’m sure your sister-in-law could take the time she needed to climb the strat and rest where she needs to. Plus, with it being months away, she has the time to work towards it, even it that’s just walking up hills or using an incline treadmill (walking) to start engaging those climbing muscles. Paul, just to give you some specifics (I’ve been called a “numbers geek”), so far there have been 5 annual Strat races, which span about 850 feet from the street. Although the fastest climbers do it in less than 8 minutes, each year for the past 3 years (since more people have found out about it) there have been people who take upwards of an hour to climb it. The longest one was in 2013 at 1 hour, 13 minutes, 22 seconds. So anyone who can climb about 11 feet in a minute (60 seconds for a typical single office high-rise floor), should be able to do it. It’s a very modern staircase with abundant fresh, cool air–great race conditions. On race day, you’ll have to climb about 50 feet to get from the street entrance to the race start (roughly 4 stories). That would be a great place to exit if your sister-in-law really experiences difficulty with that many steps in a few minutes. Once you cross the point of no return, there are water/rest stations located about a third of the way up (roughly 250 feet above street level), & at 2/3’s of the way up (about 500 feet above street level). Once you reach the finish line, there are refreshments & paramedics who can provide oxygen if needed. Note that they’re planning to have a practice session on Saturday, January 23rd from 7-9 AM that (as in previous years) will allow you to take the elevator up to the pod, & simply climb its 9 (measly) stories as many times as you’d like. Not quite the same as the race, but if you expect to take about half an hour to do the race, you can spend at least that amount of time practicing to see what a climb of that duration feels like. Remember that climbing the Strat is not only a fun accomplishment to brag about, but it helps raise funds for the American Lung Association. Great info for me, and I will pass it on to my sister-in-law and climbing compadres.